While your mom deserves the best each and every day, Mother's Day gives both grown and little kids an excuse to really celebrate the lady of honor. The following projects can help personalize your holiday, and up the wow factor while you're at it. Glue blooming roses, peonies, and other full florals to a cardboard banner to welcome Mom to her party. Studio DIY's tutorial includes a template for the banner shape, as well as a great tip for transferring a cute font to the cardboard. Knit carnations through a lovely white lattice (available at most home supply stores) to reveal a special Mother's Day message. This project provides a stunning backdrop for family photo ops during your celebration. Surprise your mom with breakfast in bed this May, and don't forget the details. Included here are templates for a sweet cake topper, a bouquet wrap, and coordinating card. A notch up from a greeting card, these adorable plaques are totally customizable to your mama. Use patterned scrapbook paper, spray adhesive, and sticker letters to create your messages with polish. Gold leaf heightens a ho-hum bouquet to a stunning centerpiece. You'll need a delicate touch for this live flower craft–but a little adhesive and a swipe of gold on the edges of rose petals makes for one chic arrangement. Grab a sturdy embroidery needle and some coordinating thread to stitch together a few carnations. This garland looks great strung across the backs of chairs, or hung outside on the patio to set for an outdoor soiree. Brandish your confections this Mother's Day with artistic, font-inspired cake toppers. This tutorial includes a template, but this craft is made immensely easier with a Cricut machine. Decorate for your Mother's Day brunch with a festive balloon arch. This piece really transforms a space and can be created in a myriad of color schemes. An at-home or rented helium tank helps this one come together quickly and easily. The small scale of this message garland makes it quite whimsical. Use a hole punch and letter stickers to achieve a polished, professional-looking product, and then pop your garland into a stack of waffles or a pretty potted plant. Drop bright blooms from chicken wire to create the illusion of a floating garden. This project would be stunning hung above a dining room table or as a piece of interactive art in the entryway of your home. Decorate a simple tablecloth with adhesive vinyl. Play around with different shapes and colors to match your flatware, and try a few different designs for other special occasions while you're at it. Add flowers to your Mother's Day decor in an unexpected way by draping a gorgeous garland over your chandelier. Pro tip: Use green floral wire to construct your garland first, then style it artfully around your light fixture. Butterflies burst from baby's breath in this sweet centerpiece. Use stickers for a super quick and easy craft, or design your own bugs on cardstock for a custom look. Portion out snacks with the help of cute Mother's Day paper cones. Guests can grab a cup and munch easily, and you'll enjoy hand patterning these to harmonize with the rest of your party-ready decor. Palm leaves are the perfect underpinning for a bright and happy wreath that welcomes guests. This wreath looks great covered completely in flowers, or with just a handful of selected blooms. Hang on the front door for the most dramatic effect. Surprise your mom with a garland of greeting strung up in the entryway. Layer doilies, stencils on letters, and add faux flowers for a polished finish. Pun it up with these delightful handcrafted drink stirrers. Pop one into a smoothie (or cocktail) to round out your Mother's Day brunch. Paper honeycombs get a makeover with the addition of lively blooms. Add a sprig of greens or baby's breath to finish off this DIY decoration. Freshen up a basic pastry stand with a coat or two of colorful paint. Get creative with stickers, Washi tape, or glitter to take your serving tray to the next level. Go for a full=on theme this Mother's Day. Add faux flowers to your dishes, your flatware, your tablecloth, and even your dining chairs a la Studio DIY. A flower-filled tablescape sets the stage for lovely and memorable photos. Personalize dessert with these lovely impressionist cake toppers. You don't have to be an amazing artist to make these work–just print, snip, tape, and pop into a baked treat. Set a make-your-own flower crown area so that mom can celebrate like the royalty she is. Guests can individualize their own crowns with silk flowers and greenery, then don them for fun photo ops. Hang a few special pieces of art around your space this Mother's Day. This printable is free, and looks adorable stuck to a wall with a bit of Washi, or framed and stood on a side table. 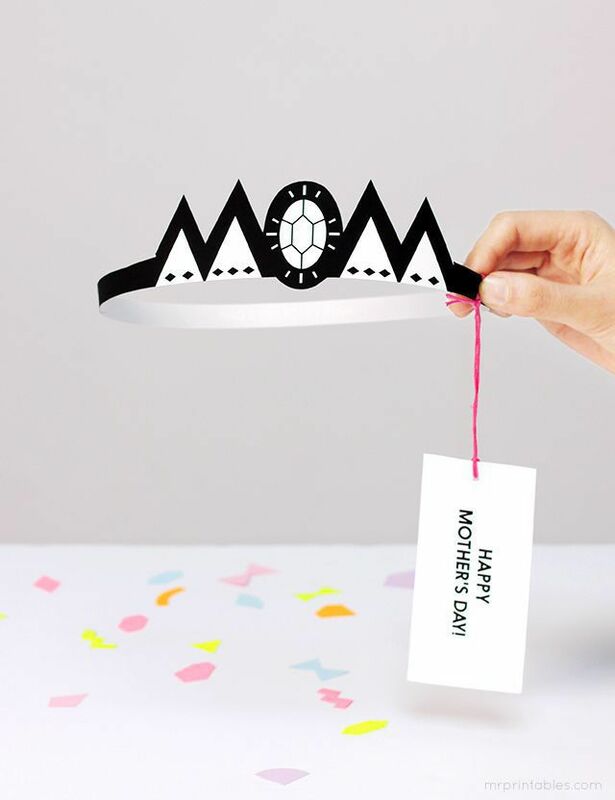 Mom will feel like a queen when you gift her this clever crown. Print a few in varying colors, so you can honor all the moms attending your celebration. As a bonus, set an embellishment station with rhinestones and glitter so guests can add a bit of bling to their crowns. Layers of paper come together almost magically to make these beautiful flowers. Add one to a gift-wrapped package to add that extra oomph, or get ambitious and attempt a whole bouquet for an arrangement that will never wilt.